MARINE CORPS BASE CAMP LEJEUNE, N.C. – Service members, colleagues, friends and family members gathered together at John A. Lejeune Hall aboard Marine Corps Base Camp Lejeune to witness Lt. Col. Guy R. Coursey receive the Bronze Star medal, Sept. 13. Coursey, who is currently serving as the installations and environment operations officer with Installations and Environment Department, MCB Camp Lejeune, received the award for his leadership and professionalism while deployed in support of Operation Enduring Freedom from August 2009 through April 2010. 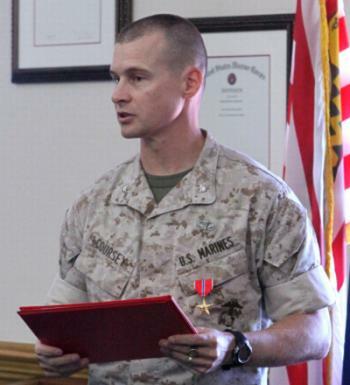 Col. Daniel J. Lecce, commanding officer of the base, awarded the medal to Coursey. Coursey, an Eagle River, Alaska, native, served as an adviser to Afghan National Army personnel and was the officer in charge of Embedded Training Team 4-5. He advised three Afghan infantry Kandaks and simultaneously led his 21-member team of Marines and sailors, who were spread out between five combat outpost areas, in executing counterinsurgency operations in the Sayedabad District of Wardak province, Afghanistan. Lt. Col. Guy R. Coursey (left), the installations and environment operations officer with Installations and Environment Department, Marine Corps Base Camp Lejeune, shakes hands with Col. Daniel J. Lecce (right), commanding officer of MCB Camp Lejeune, after receiving the Bronze Star medal during a ceremony at John A. Lejeune Hall aboard the base, Sept. 13. Coursey, an Eagle River, Alaska, native, received the award for his leadership and professionalism while deployed in support of Operation Enduring Freedom. Walter Reed Army Medical Center in Washington, D.C., and constantly faced imminent danger as they battled the terrorists' improvised explosive device attacks, direct and indirect fire attacks. In spite of the challenges, Coursey said each member of the team played their part and worked as one so they could ultimately build strong relationships with the Afghan militia. Coursey credited this team for his latest award and said it was an honor and a privilege to serve with them. ETT 4-5 was one of the last Marine ETTs in the region. Coursey also said his family played an instrumental role in both of his personal and professional success in the battlefield. Lecce said Coursey and his team played a vital part in the War on Terrorism by fostering strong international relationships and winning the hearts and minds of the Afghan people.